We’d love your help. Let us know what’s wrong with this preview of Food by Mark Hyman. Even the most health conscious among us have a hard time figuring out what to eat in order to lose wei #1 New York Times bestselling author Dr. Mark Hyman sorts through the conflicting research on food to give us the skinny on what to eat. To ask other readers questions about Food, please sign up. Taubes set the facts straight! His book is the best comprehensive- up-to -date - well respected and documented in “The Case Against Sugar”. .... a very powerful addictive drug-like effect for many people. Mark Hyman and Gary Taubes are both - two of the most respected - committed qualified men restoring the health of our nation. To be fair ....I could name at least a dozen other experts in the field ...all on the same team: restoring the health of our nation.....I’ve been following them all - have participated in summit seminars - weekend workshops with these doctors - and nutritionist for approximately 30 years. I HONESTLY BELIEVE ITS THE BEST BOOK OF ITS KIND....THE MOST COMPREHENSIVE UP -TO -DATE USEFUL INFORMATION that EVERY HOUSEHOLD would benefit owing ...reading ... and referring to as a resource. It’s the PERECT COMPANION to Gary Taubes book, “The Case Against Sugar”. but now I’m 100% sure I want to own a physical copy. I’d give this book as a ‘perfect gift’ at a BABY SHOWER! No, kidding...raising kids is no easy task ...the the book is the best FOOD BIBLE ...clearing up misconceptions that we have to date — and who better to have written it - but a qualified medical doctor who has solid reputation in this field. The structure is designed to either read straight through - or jump to a particular food group you want to know more about. For example ....let’s talk about BEANS for a moment. Is there any controversy or concerned about the *bean*? High levels of nutrients - and as far as plants go - unmatched amounts of protein..... a cheap and plentiful source of fiber, vitamins, and minerals. As you will continue reading about THE BEAN .....( or substitute other foods in this book: vegetables, fruits, poultry and eggs, meats, grains, nuts and seeds, milk and dairy, fish and seafood, fats and oils, sugars and sweeteners, beverages, the pagan diet, etc. etc. ), Mark will show us the the beans on beans — ALTHOUGH HAS BEEN KNOWN TO LOWER BLOOD PRESSURE AND LOWER THE RISK OF CANCER.....is NOT A SIMPLE AND CLEAR POSITIVE FOOD FOR ALL PEOPLE. However.....Mark clears up the questions-of- concern. .....very easily. By the time you are done reading about a particular food.... YOU WILL BE PRETTY DAMN CERTAIN ....99.9% which foods BEST WORK FOR YOU .....( this book can be validating for things you suspected). unless I like being depressed, bloated, and gaining weight. Mark has not only a lot to say about this .... but I was laughing at the ridiculousness I discovered- through reading the EGG SECTION .... of what different egg cartons say on them in the supermarket. FREE RANGE EGGS.... I started laughing when I learned what it really means. GLUTEN FREE EGGES..... OH MY! Best laugh I had! The packaging of our foods - the “PURE SELLING TEASERS” start to be rather funny....if not scary! MEAT.....the *M* word .....a word MY CHILDREN WERE ASKED NOT TO *SAY* in their 4th grade class because their teacher was a vegetarian—and her daughter a veterinarian. It was the beginning of our daughters eating disorder. She came home from school one day - age 9, and said, “I don’t eat Meat”....”I be nice to animals”. Our pediatrician said to honor her wishes and feed her lots of beans. By age 14 - she had a serious eating disorder weighing 65lbs and was hospitalized. Thankfully our daughter is well today - strong & lean - eats lean proteins ( some meat). Mark doesn’t advocate to be or not to be a vegetarian - meat eater - vegan - or any specific spiritual or personal choice diet .... it’s ALL INCLUDED ....but the myths are exposed. .....even though my doctor is telling me to eat dairy products since I was diagnosed with osteoporosis this year. I was never much of a dairy girl...and there still seems to be confusing information of how I’m to GAIN *BACK* my bone loss - build new density. Exercise seems to be the only ‘sure’ thing all experts agree on. Keifer which I’m now taking daily is a “WE STILL DON’T KNOW FOR SURE”, of the benefits. THANK GOODNESS I’m eating those little fishies.....sardines, often now. Trying to build back bone density at age 65 is a challenge - but a game worth fighting for. There is a wealth of HEALTHY SCIENCE -BASED INFORMATION IN THIS BOOK. I haven’t even skimmed the surface. ITS REALLY A HUGE GIFT TO ALL OF US! Mark has many videos worth watching - great books - and many ways he offers support. He says “getting healthy is a TEAM SPORT... and unfortunately many of us are lacking the positive encouragement and supportive relationships we need in order to move toward our best selves”. I had read this quote by him ways back. I happen to agree....that one of the biggest challenges for many of us —is feeling alone, stuck in a rut, unmotivated, sometimes like a complete failure because we gave into our junk food craving — wishing ongoing wellness - personal support if needed - to literally everyone! I include myself - with my own challenges - my family - and close friends. This book is a golden ticket for consumers to cut through all the conflicting messages we receive about food....emphasizing that food is our best preventive medicine in avoiding diseases and living a healthier life. This book definitely made an impact. It remains to be seen what effect it will have, if any. Hence, the no-rating. In a nutshell: Beans: not as great for you as we’ve been led to believe; dairy: quite harmful; carbs: not needed. Beef/eggs: necessary. Organic, good quality products: almost always the answer! It’s a quick read, extremely accessible, with lots of thought-provoking nuggets: Dr. Mark Hyman isn’t afraid to get political or environmental, either. I’ve gone ahead and ordered myself a good This book definitely made an impact. It remains to be seen what effect it will have, if any. Hence, the no-rating. I’ve gone ahead and ordered myself a good multivitamin, some fish oil, purchased some grass-fed beef, avocado oil, and grass-fed ghee. And some cans of Alaskan-wild caught salmon. I’m going to limit carbs (I’ll never give them up) and quit dairy temporarily, just to see if it’s the culprit to acne at 40, low energy, and stomach issues. That’s right--it’s important to eat a wide variety of veggies, especially the odd ones! Forgot those common veggies you see at the market. Instead, “Eat all the strange, weird, and unpopular veggies instead of the boring, all-too-common ones.” If you find some strange sea vegetable from Japan, eat it! Stanford University/NIH Study of 609 dieters concluded that either a low-fat or a lo If You Come Across A Strange Sea Vegetable, Eat It! Stanford University/NIH Study of 609 dieters concluded that either a low-fat or a low-carb diet has similar benefit—as long as the food is HEALTHY. The head researcher notes: “Eat less sugar, less refined flour and as many vegetables as possible. Go for whole foods, whether that is a wheatberry salad or grass-fed beef.” Wow—these recommendations sound very similar to Dr. Hyman’s recommendations. Eating unusual veggies is just one of the fun tips that Dr. Mark Hyman presents in, FOOD: WHAT THE HECK SHOULD I EAT? The author covers some of the hottest topics in diet research, and explains what we’ve gotten wrong. Okay, I totally confess I had no idea about the nutrition of more wild produce compared to modern produce. I am VERY surprised. So all in all, I found FOOD to be a helpful book, with tons of great ideas. I realize that I am chugging down way too much sugar (I love ice cream and pies!) I found the chapters on veggies and fruit the most helpful, as I just didn’t realize how modern fruits and vegetables have so much less nutrition than less refined varieties. Excellent information! Finally, realize that there is a LOT of material in this book, and it can be a little overwhelming. Fortunately, the doctor writes well, and I found his points easy to follow. After presenting each topic, Dr. Hyman summarizes, ”What The Experts Got Right, ”What They Got Wrong,” and “What We Still Don’t Know For Sure.” I liked his succinct summary of the issues, and especially appreciate the author telling us where the science is not really settled. Well-researched and well-written, in an easy-to-understand format. However, I do want to caution that the information Hyman presents is as of right now, and I emphasize RIGHT NOW! Nutrition is a science and science is forever changing! Having said this, Hyman tells us what the researchers / science got right (thus far) about specific groups of foods, what they got wrong, and what they don't know yet. He supports each "argument" with various studies (research) that support his st Interesting read! Having said this, Hyman tells us what the researchers / science got right (thus far) about specific groups of foods, what they got wrong, and what they don't know yet. He supports each "argument" with various studies (research) that support his stance and based on this information, makes recommendations for what we should eat, what we shouldn't eat, what we should stay far away from, and in some cases how to find the "good stuff." The chapter on nuts and seeds was absorbing. Does meat contribute to global warming? "Globally, one-fifth of all our energy consumption is used for industrial agriculture. That is more than is used for all our transportation - cars, trucks, planes, trains, boats - combined!" Milk increases our risk for cancer. Avocados are almost 80% fat, most of which is monounsaturated - the kind that's been shown to protect against heart disease and strokes. They contain good amounts of fiber, and even more potassium than bananas! A banana is not the best fruit to eat because it is high in sugar. Kidney beans are high in starch and with regards to plant protein, they rank low, meaning you'd have to eat a ton of beans to get the approximately 30 grams of protein you need per meal, and eating a ton of this bean is not good because of all of the starch. The section entitled, "There Are Many Ways to Say Sugar" was most enlightening. Another section that was good was the one on things that you can add to your diet, especially with regards to spices and herbs, as well as other condiments. Good for those that believe in removing sugar and processed foods from their diet but don't want or believe in eliminating entire food groups, this book provides good information on the best choices from an health, economic and environmental consideration. Food What the Heck Should I Eat opens with an easy challenge to help readers learn how much they know about food. 1. Pepsi has learned how to grow and harvest human taste buds in the lab. 2. The sugar industry drives our obesity epidemic. 3. We eat Frankenfoods: factory-made, industrial produced food-like substances that contains transfat, high-fructose corn syrup, monosodium glutamate (MSG), artificial sweeteners and colors, additives, preservatives, pesticides, antibiotics, new-to-m Food What the Heck Should I Eat opens with an easy challenge to help readers learn how much they know about food. 1. Pepsi has learned how to grow and harvest human taste buds in the lab. 2. The sugar industry drives our obesity epidemic. 5. Don’t trust the American Heart Association health claims. Food What the Heck Should I Eat is for readers who are interested in factual information about food and the food industry. Food What the Heck Should I Eat is comprehensive and the information provided will not only help save my life but help me live a longer healthier life. Included are web sites where you can purchase safe foods. This book was awesome! I love how it was set up and how it tackled ethical and sustainable issues with each food in addition to health benefits and pitfalls. It is backed by research, explained in a way that does not require you to have an extensive medical background, leaves the reader with no further questions. A very disappointing book, I ended up more confused than ever about the healthy diet. The author keeps reminding us that we are supposed to eat like our ancestors, the hunter gatherers before the invention of the great evil the agriculture. Yet we are not living that lifestyle anymore, spending endless hours siting at our desk or on the way to and from places, no do we have the luxury clean air and long sleep. We freed our time and our bodies with the invention of agriculture and now can enjoy d A very disappointing book, I ended up more confused than ever about the healthy diet. The author keeps reminding us that we are supposed to eat like our ancestors, the hunter gatherers before the invention of the great evil the agriculture. Yet we are not living that lifestyle anymore, spending endless hours siting at our desk or on the way to and from places, no do we have the luxury clean air and long sleep. We freed our time and our bodies with the invention of agriculture and now can enjoy doing other staff rather than chewing tough barely cooked meats or bitter greens. Apparently, the author of this book wants to ignore the reality of our wonderful modern lives and go back to what? Hunting our own prey? Almost, since he thinks we have endless free time to hunt down dubious supposedly healthier variety of wild salmon or grass fed beef. Dubious because the certification of the organic variety is rather haphazard and tough to check on your own (but he provides a handy list for you at the end). Also supply of the wild fish is dwindling down all over the world and unsustainable at the current rates of fishing. Same with the grass fed beef, it is too much strain on the planet as it is as more and more people all over the world eat lots of meat. Regarding meat consumption, the book is structured that way that you get the impression that this is the way to eat, also I doubt our ancestors eat any meat for days or weeks at times, certainly not everyday! I laugh on the advice on dairy, as people do evolved to digest eat quite well even in Asian countries. Antibiotics use is of concern, but we all live with certain restrictions, it is a trade of for convenience, nothing less. GMO is good for the planet and for the future of food, stop with the fear mongering! Soda is not good for you, but diet soda doesn't promote weight gain. Tons of studies on this, juts look it up. As a student I survived for years on my favorite diet coke, yet never gain any weight or had any sugar cravings. Grains are a major staple all over the world, including countries with long longevity rates such as Japan. One has to wonder how they managed to survive this supposedly toxic level of rice consumption and still live into the late 90s or even 100s! Coconut oil is just another hype product, all over the news as healthy alternative to everything bad from yesterday. Wait a little bit, it might soon become the evil bad food again, don't jump on the hype bandwagon too fast. In fact, it seem to be the only valid point in the current overwhelming research on nutrition. So many contradictory new theories ans studies, so many long established facts completely turned upside down that one is at a loss. This book seems to be written for the elusive 1 % of the population with enough resources and time (or the ability to outsource all this hunting for organic everything and long hours cooking it). This book was recommended to me by a friend who knows what it is like to struggle with intestinal issues and never quite know which food is the culprit. There is a tremendous amount of scientific research that Dr. Hyman has collected regarding which foods we can eat to help us become healthy again. His diet called "Pegan," a cross between the Paleo and Vegan diets, makes perfect sense to me. He writes about so many facts about the food industry that are very disturbing....look at any label on jus This book was recommended to me by a friend who knows what it is like to struggle with intestinal issues and never quite know which food is the culprit. There is a tremendous amount of scientific research that Dr. Hyman has collected regarding which foods we can eat to help us become healthy again. His diet called "Pegan," a cross between the Paleo and Vegan diets, makes perfect sense to me. He writes about so many facts about the food industry that are very disturbing....look at any label on just about any can, bottle, or boxed food item, and you will find sugar as an ingredient among other unhealthy additives. I liked how this book was structured, so I could easily read a chapter or two a day without becoming overwhelmed with the truth about our foods. I acknowledge how difficult it is to change eating habits....I also realize that it is essential to do so unless I want to continue having an upset stomach every few days. Already being a fairly healthy eater, I'm not sure what I expected from this book . But I know I didn't expect to come away feeling that nothing is safe to eat! Unless I have access to only grass fed lamb and beef, chickens that run happily around on the farm all day and produce that has never been touched by a chemical, then I'm doomed to eat garbage- literally! I find that what this book suggests is out of the grasp of most people. When he said he worked on the "Fed Up" documentary, I stopped reading. My opinion is based on that. Enjoyed this; most of it made good sense to me. The reminder that the grain and corn we eat today is very different (thanks to Round-up and GMOs) from the grain our grandparents ate helps me realize how much the food world has changed. I know I won't follow Dr. Hyman's recommendations right now -- I won't limit my dairy, bean, grain and sugar consumption as much as he suggests. But I am making some changes based on his ideas. I've bought chia seeds. I'm switching over to whole milk, non-sweeten Enjoyed this; most of it made good sense to me. The reminder that the grain and corn we eat today is very different (thanks to Round-up and GMOs) from the grain our grandparents ate helps me realize how much the food world has changed. I know I won't follow Dr. Hyman's recommendations right now -- I won't limit my dairy, bean, grain and sugar consumption as much as he suggests. But I am making some changes based on his ideas. I've bought chia seeds. I'm switching over to whole milk, non-sweetened yogurt. My breakfast now is just a little oatmeal with a lot of yogurt and berries (instead of bananas). It's hard to buy as much organic as he recommends but I'm doing a little more. I had already been trying to eat more fruit, less juice. I respect what he says about corporations and lobbies driving the American diet. My guess is that not all of his ideas will stand up to future research but I think a lot of them will. Doporučuji nečíst!!! Tedy pokud nechcete vážně začít přemýšlet co máte vlastně na talíři. Autor se zde dopodrobna věnuje jednotlivým potravinám a říká na co je dobré si dát pozor a čemu dávat naopak přednost. Zároveň zmiňuje, že každý z nás je jiný a je dobré si najít v jídle takovou cestu, která nám nejlépe sedí. I to jak tu cestu najít zde najdete. What sets this book apart from other books about food is its global perspective: Dr. Hyman describes the environmental impact of each food category he discusses, generally arriving at the conclusion that foods that nourish us best also nourish our spirits and our entire planet. He has a strong focus on the humane treatment of animals, given his life experience as a (former) vegan. Had I read this book twenty years ago, I could have saved myself a lot of stomach aches and probably thirty pounds. What sets this book apart from other books about food is its global perspective: Dr. Hyman describes the environmental impact of each food category he discusses, generally arriving at the conclusion that foods that nourish us best also nourish our spirits and our entire planet. He has a strong focus on the humane treatment of animals, given his life experience as a (former) vegan. Had I read this book twenty years ago, I could have saved myself a lot of stomach aches and probably thirty pounds. Dr. Hyman offers a lot of information I already knew, but information so correct and useful that it deserves repeating: fake oils, fake sugar, sugar, highly-processed foods, and much of the western diet may keep people's stomachs full, but it kills us little by little. I mourn when I see people purchasing soda and white bread. The information in this book is also scientifically well-documented, apart from the discussion of dairy: Dr. Hyman never discussed raw milk products, which are entirely different from pasteurized, homogenized dairy products. I am one of the 30% of people (according to Hyman's statistics, and 30% of people is a substantial number of people) of Scandinavian descent whose ancestors developed a capacity to tolerate milk, who survived because of that capacity, who enjoy dairy products, and who gain benefit from including dairy in our diets. I also did not believe it when eggs were considered Satan incarnate and never gave up my yolks, and I'm not going to give up milk. Maybe Dr. Hyman is like my husband, and cannot tolerate dairy products, but I have not seen research showing that raw dairy products are harmful to people like me, who tolerate milk well. 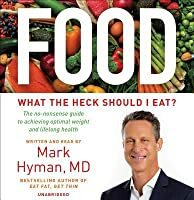 In “Food: What the Heck Should I Eat?” Dr Mark Hyman expertly guides the reader through the many nutrition pitfalls of modern life. Each chapter goes deep into a food group, starting with meat. Nutritional studies are mentioned and meticulously noted. He is as concerned about the environment as he is about human health, so environmental factors pop up in every food chapter, giving weight to the advice to eat better, not just for ourselves, but also for future generations and the health of the pl In “Food: What the Heck Should I Eat?” Dr Mark Hyman expertly guides the reader through the many nutrition pitfalls of modern life. Each chapter goes deep into a food group, starting with meat. Nutritional studies are mentioned and meticulously noted. He is as concerned about the environment as he is about human health, so environmental factors pop up in every food chapter, giving weight to the advice to eat better, not just for ourselves, but also for future generations and the health of the planet. I have been reading a lot of new books on nutrition recently, so much of the information was not surprising to me. The author advises us to avoid all processed foods and industrial seed oils. He suggests to be wary of dairy, sugar and grains but to eat lots and lots of vegetables with grass fed meat, sustainable seafood and pasture-raised chicken & eggs. Even though I agree wholeheartedly with his advice, I don’t know if I can stop eating bread, or if I’ll ever have the willpower to give up dairy. I like vegetables but eating them three times a day is not going to be easy. I already cook most of my own food and avoid processed junk, I’m not sure how someone eating the standard American diet would manage to make such sweeping changes. This advice is also going to be tough for people on a strict budget. Veggies are affordable but high quality oils and fats are not, and grass fed meat is very expensive. It would be wonderful if we could all eat this way, but can we? If you are confused by all the conflicting information about food and what we should eat, then read this. I heard Dr. Hyman on a podcast and decided to read this book and I am so glad I did. He has done an insane amount of research and his advice and guidelines make total sense. The government really did us dirty by promoting a low fat diet back in the 90s and 2000s, telling us that fat and saturated fat and meat would cause heart disease. Guess what? It doesn't. Know what's making America fatte If you are confused by all the conflicting information about food and what we should eat, then read this. I heard Dr. Hyman on a podcast and decided to read this book and I am so glad I did. He has done an insane amount of research and his advice and guidelines make total sense. The government really did us dirty by promoting a low fat diet back in the 90s and 2000s, telling us that fat and saturated fat and meat would cause heart disease. Guess what? It doesn't. Know what's making America fatter and sicker? SUGAR. By telling us to eat low fat, companies produce all kinds of processed low fat junk that's augmented with sugar, chemicals, and all kinds of stuff that we can't pronounce. Dr. Hyman's approach is a cross between Paleo and vegan which he calls Pegan. Basically it's eating real, high quality food. If you’re someone who wants the WHY behind your nutrition choices - this is the book for you. Dr. Hyman breaks down the science, the research and the business behind what we eat and what’s being sold to us - to help give you a clear picture of what you want to eat to be your healthiest and WHY. I listened to this on audiobook and I’ll be picking up a hard copy so I can refer back to it often. I deeply respect Mark Hyman and have been wanting to read his books for quite a while. So when this book came out, I quickly purchased it. Mark Hyman, MD, is the director of the Cleveland Clinic Center for Functional Medicine. He believes we should get to the root of the problem and not just cover up the symptoms with prescription drugs. I truly believe in this too, thus my deep respect for doctors such as Mark Hyman. I also deeply respect him because he is passionate about what he does. 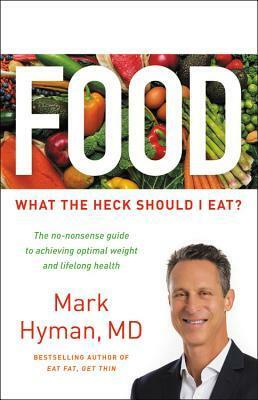 Now abo I deeply respect Mark Hyman and have been wanting to read his books for quite a while. So when this book came out, I quickly purchased it. Mark Hyman, MD, is the director of the Cleveland Clinic Center for Functional Medicine. He believes we should get to the root of the problem and not just cover up the symptoms with prescription drugs. I truly believe in this too, thus my deep respect for doctors such as Mark Hyman. I also deeply respect him because he is passionate about what he does. Now about the book ... I loved this book! Why did I love this book? 1. The information is phenomenal. In this day and age, it's hard to say what is healthy and what is not. There are so many conflicting opinions and so much information to convince you that any one diet is correct and the others are wrong. One doctor may say Vegan is the way to go and to eat lots of whole foods like rice and beans along with vegetables. Another doctor/nutritionist/health guru may say to stay away from heavy carbs like rice and beans and to eat more meat. And yet other opinions, like the Keto enthusiast may say to eat lots of dairy vs. other authoritative figures that may tell you that dairy is inflammatory and to stay away from ALL dairy. And what about things like potatoes? The Whole 30 diet says they are fine, but the Paleo diet says otherwise. Who do we believe and what do we do? And then there are anti-cancer diets that tell us to eat ALL vegetable and ALL fruits, yet again, Keto enthusiasts will tell us that certain vegetables and fruits are high in carbs and rank high on the glycemic index and to stay away from those. What the heck do we do?! It used to be as simple as just eating whole foods, but that is no longer the case!! Well, I believe the answers to all of these questions are in this book! Mark Hyman spells it out for you in a very clear and concise way. He simplifies your approach to eating. Hint: he does believe you can eat things like rice in moderation IF you aren't trying to loose weight or have any other major health problems. 2. I loved the format of this book. Part I addresses the food confusion, fear and insecurity and it is short and to the point. Part II is the bulk of the book and each chapter in this section is organized by food group (meat, poultry and eggs, milk and dairy, fish and seafood, vegetables, fruit, fats and oils, beans, grains, nuts and seeds, sugar and sweeteners, beverages). *The food group chapters each start with a nutrition IQ Quiz. The quizzes are full of statements that most of us have been taught, either by the FDA / the government pyramid or by other "experts". *He then explains very briefly why those statements are true or false. *He then talks briefly about the science of that particular food group. *Next he address what the experts got right and what they got wrong. He backs up this information with research. *He then goes into detailed information about the food group, how to buy it, where to buy it, how to cook it, and addresses myths about that food group, etc. This makes up the bulk of the chapter and is very interesting information that will be very useful to understanding they why's and why not's of eating this food group and the how to. *Finally the chapter summarizes what the chapter provides: this section really simplifies and re-iterates what we just read in the chapter. For those who don't care to read all the scientific data or they "why's" behind whether we should or shouldn't eat a food group, you could skip right to this section and still gain all the information you need to know what the heck you should eat! Part III goes into what you should keep out of your food. He goes into things like unhealthy processed foods, pesticides, additives, GMO's, antibiotics, hormones, chemicals, refined oils, salt, etc. and explains what is okay and what is not. This information basically is one chapter of the book and is very informative and after reading it, I am definitely more aware of what is in foods and what I should be looking for and what is okay. Part IV is basically the "how to". He explains the importance of first detoxing and then he gives you a specific meal plan with recipes to get you started. The diet seems pretty do-able and it actually a lot easier then most diets out there in my opinion. **Interesting notes: Dr. Hyman calls his diet "The Pegan Diet". This name came to him when he was sitting on a panel with two other doctors; one was a Paleo advocate and the other a strict vegan cardiologist. Dr. Hyman was sitting in the middle so he joked , "Well if you're Paleo and you're vegan, then I must be a Pegan. This Book is For: de-mystifying the current research and information around diet, nutrition and lifestyle. Mark Hyman is an OG in the functional medicine space and a genuine pioneer in the field of optimal nutrition. I’m personally a massive fan - I find his writing down to earth, pretty easy to follow and most importantly of all, downright practical. Hyman is no talking head - he is a clinician in practice and actively involved in the science of functional medicine. The book is incredibly well researched, extensively referenced and supported by the latest thinking in the various areas of food and nutrition. Pleasingly, he tackles the pros and cons of the paleo diet, Atkins and even the current craze the ketogenic diet and presents a compelling case for why none of them, including the previous darling the low-fat, vegetarian diet represent a complete solution for health - however, he does advocate the ketogenic diet for individuals with diabetes and severe auto-immune disease. I highly recommend this book and have done so to friends and family members - I’ve even gifted it to a few people to encourage them to read it! I would note, like all health books, this book will definitely not be readily accepted by close-minded individuals who love their flour and sugar or perhaps their French fries. That being said, they may or may not come to the book and the science if and when a health crisis impacts them or a loved one. This centrality of food to our existence as humans was really powerful for me - not a new idea of course, and for centuries ancient medical traditions have taught that Food is Medicine, but overlaying the role of food in culture, and in creating meaning and belonging for me was again not new, but a neat thread to join with the medicinal and health elements or even the functional benefits of food as macro and micro nutrients. Finally, appreciation of food and food purchase and consumption as an environmental decision is another area that I’m passionate about personally - how we essentially in a “rigged” political system can vote with our consumption dollars to improve the economy and the environment, reduce pollution and in doing so support and develop industries that make the world a better place for ourselves, our kids and the generations that follow. That is bloody powerful stuff. As a natural medicine practitioner, I am well aware of the role that food can play in enhancing health, alleviating symptoms and in restoring health but also it’s potential role in consolidation of disease, and indeed as a poison for the body and mind. Defining Functional Medicine - the best model we have for addressing our chronic illness epidemic - the medicine of why, not the medicine of what (holism vs. symptomatic relief). It is about why you have a disease, not just naming a symptom or cluster of symptoms and then prescribing something to perhaps temporarily reduce those symptoms - a massively reductionist and flawed approach that propigates, rather than fixes root causation. Meat - vegetarian or vegan diets are simply too challenging to fulfil an adult or child’s protein requirements effectively either at a macro-nutrient level or in terms of essential amino acids. Recent and no-so-recent scares around the consumption of meat being linked to an increased risk of cancer and heart disease, Hyman says are flawed and based on key researchers in influential studies and meta analyses cherry picking the data. In fact, the foods found to be the biggest drivers of disease in these studies were high glycemic-index carbohydrates like potatoes, bread, and cereal. We are what our meat eats - factory farmed animals are fed cheap, mass-produced grains because it fattens them up quickly at lower cost. That means that they are inevitably eating GMOs and pesticides (as well as the other non-traditional foods that factory farmers seem to think are appropriate to feed livestock - stuff that you would never ever want them to eat - like feathers, animal poop, plastic, bacteria). They’re also pumped full of hormones and antibiotics because that makes them bigger and fatter too. Grass-fed is the best option. Cattle in particular are not designed anatomically to eat grain and when forced to do so, can develop bloating, liver disease and other conditions. They are also more susceptible to infections that can linger on in their meat and pass into our bodies through consumption. Grass-fed meat also contains conjugated linoleic acid or CLA - a highly beneficial fatty acid, that serves as an antioxidant that can slow the progression of some cancers, reduce plaque formation in the arteries as well as reduce risk of diabetes and heart disease and help with weight control and metabolism. Include organ meats (from grass-fed sources). Use low-temperature cooking methods - grilling and frying are generally hazardous when applied to meat - unfortunately particularly so when the meat is charred or barbecued. Meat as a condiment, not as the main event on your plate. Limit processed meats - think of bacon and sausage as a treat food, not an everyday food staple. Buy local wherever possible. Buy organic and/or pasture-raised chicken, duck, or turkey and pasture-raised, organic or omega-3 whole eggs. Eat egg yolks - but clean the eggs before eating them. Bake, don’t fry or grill your chicken. Wash it thoroughly before eating it. Today’s cow’s milk contains dozens of reproductive hormones, allergenic proteins, antibiotics, and growth factors, some of which are known to promote cancer, such as IGF-1. Dairy causes problems in people who have leaky gut and IBS - most people can’t actually stomach milk - around 70% of the world’s population suffers from milk-induced digestive distress because of lactose intolerance. All the pro-milk advice from the “experts” was based on dairy industry promotional activity. Milk is not good for our bones. Low-fat milk is not good for you. In fact, countries with the lowest milk consumption have the lowest rates of osteoporosis and fractures - while those with the highest consumption have the highest rates of fractures (WTF?!?) - bone mineral density is actually produced by physical activity, not by dietary sources of calcium. Other non-dairy sources of calcium include - sesame seeds, sardines (with bones), collard greens, spinach, cheese, Bok Choy, almonds. Milk is shown to increase our risk for Cancer. Limited quantities of grass-fed butter is ok. If you are lactose intolerant or sensitive to dairy - avoid it at all costs. Even if you’re not, milk should not be a big part of your diet. If you have digestive issues, auto-immune disease, weight gain, type 2 diabetes, PMS, infertility, skin disorders like acne, eczema or psoriasis, allergies of any kind - you should avoid dairy. It is ok (if none of the above apply) to have a little bit of grass-fed milk, cheese and butter from time to time - provided that they are full-fat, free of additives and ethically and sustainably produced. We should be eating seafood at least three times a week - the best sources are sustainably sourced fish - stay away completely from farmed seafood *unless it is organic and from wild fish with a lot of toxins. Smaller fish are better than bigger fish as the larger fish accumulate more mercury. Eat the following - wild salmon canned or fresh, small toxin-free fish like sardines, anchovies, herring and mackerel, clams, scallops, mussels and oysters. Avoid big fish, farmed fish, tuna, sushi and imported shrimp. Things we need to know - eat the rainbow - a variety of coloured mainly vegetables and fruits. Eat organic wherever possible and especially - celery, spinach, tomatoes, bell peppers, cherry tomatos, cucumbers, kale, collard greens, leafy greens and hot peppers. Some ground rules - always wash produce throughly - scrub them with a vegetable brush. Some people also suggest washing with a dilute solution of 3% hydrogen peroxide. Frozen vegetables are about as nutritious as fresh and sometimes more so. Buy organic frozen veggies! The best way to cook (all) vegetables is to steam them for no more than 4 minutes - they should still be bright and crunchy when eaten. Don’t deep fry or microwave your vegetables. Eat locally grown, organic vegetables wherever and whenever possible. Eat a load of broccoli, kale, cabbage, Brussels sprouts, and other members of the cruciferous vegetable family. Eat a load of dark leafy greens, spinach, Swiss chard and collard greens (also crucifers), eat alliums such as garlic, shallots and onions. Eat sweet potatoes and winter squash sometimes - don’t binge. Avoid - iceberg lettuce, white potatoes, raw button mushrooms, alfalfa sprouts, most supermarket tomatoes, peppers, egg plants and other nightshades. Focus on lower sugar fruits - berries, apples and pears - use all the others are treats in smaller quantities. If you’re overweight, diabetic or have other blood sugar issues, then be more careful - limit fruit intake to 1/2 cup of berries or one piece of fruit per day. Eat the following - wild, organic, fresh blueberries, cherries, blackberries, and raspberries. Frozen organic berries either thawed or in shakes or frozen desserts. Organic stone fruits, organic citrus fruits, pomegranates, kiwis and papayas, goji, açai, gooseberries, mangosteens. Focus also on the “fat” fruits like avocados, coconut, and olives. Use lemons and limes liberally to flavour food and drinking water. Avoid and limit grapes, bananas, pineapples - avoid conventionally grown apples and strawberries - they are among the worst offenders when it comes to pesticides - buy organic. Avoid any and all fruit juice - especially when you didn’t squeeze it yourself. Must know: consuming lots of natural whole-food based healthy fats, including saturated fats, is absolutely critical for your health. Focus on eating the fats and oils that our ancestors ate and banish the industrially produced, highly processed ones from your kitchen. To keep it simple - limit yourself to two - organic, cold-pressed extra virgin olive oil and organic virgin coconut oil. Use olive oil liberally on your food, but don’t overheat it, use coconut oil for cooking at higher temperatures. Use both orally and topically and on your hair. Remember - fats combined with starch or sugar are like rocket fuel for weight gain. You actually don’t need to eat them at all. Any vitamins or nutrition you can get from grains, you can get from a variety of other sources - vegetables, fruit, nuts, seeds and other foods that don’t have the baggage that comes from grains. We don’t actually need to eat carbs! At all! For nearly all of our history, humans consumed no grains and our bodies are designed to work very well without them. Flour = sugar. When you eat something containing wheat flour, you may as well be eating sugar. Gluten is not our friend - our bodies don’t know how to process it and in some cases, it is a poison. Grains these days are not the same as the ancient grains our ancestors may have eaten - super starches, chemical herbicides used in production all contribute to the harmful and as a minimum the immune impact of grain consumption. Cereal and oatmeal are not health foods - like all other grains, oats spike your blood sugar and make you hungrier. Treat grains as treats or sometimes food. Think of them the same way as you think of alcohol. But only eat them if they are whole-grains, organic and gluten-free. No more than once a day and no more than 1/2 cup serving max. Do not eat grains if you’re type-2 diabetic, have issues with weight control or cravings, have food sensitivities, IBS or acid reflux, if you have any auto-immune disease or you feel bloated after eating. Eat almonds, walnuts, pecans, hazelnuts, Brazil nuts, pistachios, macadamia nuts, cashews, pumpkin seeds. Don’t eat chocolate nuts, peanuts, and nut butters with trans fats added. Sugar is damn addictive and can dramatically alter your metabolism and brain chemistry causing you to suffer intense cravings. Quitting sugar, like quitting cigarettes, improves your health massively and rapidly - blood pressure falls, LDL cholesterol drops, triglycerides drop, fasting blood sugar and insulin levels improve significantly. Sugar (and fructose without fibre) is highly toxic. Key concepts: get off sweeteners as much as possible - they are addictive and blunt our receptors of other tastes and flavours. If you are cooking with a sweetener, use fresh pureed fruit, molasses, organic palm sugar, date sugar, coconut sugar, monk fruit, organic maple syrup, honey (ethically sourced), stevia sparingly. Avoid all artificial sweeteners, sugary beverages, high-fructose corn syrup, agave, brown rice syrup - basically all packaged foods. Water as pure as possible RO filtered. Green tea, brewed at home, coffee in moderation, wine in moderation (1 glass a day), spirits in moderation (1 glass a day), homemade green juices, shakes and smoothies without high-sugar fruits, coconut water and watermelon water. Avoid all bottled water, fruit juices, any fruit juice or smoothie you didn’t make yourself, sweetened coffee drinks, milk, beer and of course any and all sodas. Interesting, but extreme. I like the idea of eating food made without a lot of processing and additives, but I don’t want to obsess about food everyday or every meal. My take aways are to buy grain feed meat and don’t make it your primary food, eat organic fruits and veggies, and eat only small amounts of sugar and flour. Water is the best thing to drink. Mainly, I think following any diet too excessively is bad. Eat a variety of food in moderation. Mark Hyman, M.D., is the editor in chief of Alternative Therapies in Health and Medicine, the most prestigious journal in the field of integrative medicine. After ten years as co-medical director at Canyon Ranch in the Berkshires, he is now in private practice in Lenox, Massachusetts. He is the coauthor of the New York Times bestseller Ultraprevention. His websites are www.drhyman.com and www.ultr Mark Hyman, M.D., is the editor in chief of Alternative Therapies in Health and Medicine, the most prestigious journal in the field of integrative medicine. After ten years as co-medical director at Canyon Ranch in the Berkshires, he is now in private practice in Lenox, Massachusetts. He is the coauthor of the New York Times bestseller Ultraprevention. His websites are www.drhyman.com and www.ultrametabolism.com.